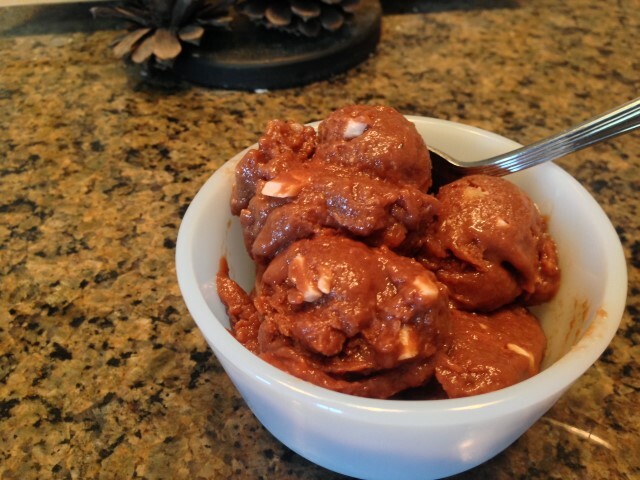 Ice Cream At Home Using Bananas, Milk and Pudding Mix! And this ice cream is made with healthy ingredients that I know & recognize so I feel pretty good about that, I’ll bet you do too. Can you imagine this scene where you’re saying to the kids “Yes kids, of COURSE you can have more ice cream!” If I’m not mistaken that qualifies you for nomination into the Parent’s Hall of Fame. Here’s how I make it: I take those bananas that are starting to spot since they always seem to be sweetest. Then I peel them and place them in the freezer until they’re frozen. When it’s time to make ice cream I pull out three frozen bananas & chop them into about 1/2″ rounds. They’re plopped into the blender with 1/2 cup of milk and about a 1/2 teaspoon splash of vanilla. If I’m making chocolate ice cream, I also add about a tablespoon of cold coffee to intensify the chocolate flavor. Then I plop it into my * Ninja Blender – man that thing ROCKS! It takes only a minute to blend it all until it’s silky smooth. Finally I add the instant no-cook pudding mix. I make my own, but again you can add a box of purchased no-cook pudding mix here. Now I just blend it all together until it’s smooth with no lumps remaining. When it’s smooth I pour the mixture into a freezer-safe container and pop it in the freezer for a few hours until it’s frozen good and solid. I’ve found if you stir it after about an hour or so it makes the ice cream a little less hard but that’s not mandatory. After your mixture freezes – VOILA! Cool fat-free refreshment during those hot days of summer. The pudding gives this homemade ice cream a creamier consistency and although It’s not quite as creamy as the high-fat stuff it’s close enough to pacify my ice cream-loving RancherMan. Of course there are a bazillion options to personalize your ice cream flavor if you like. You can change up the flavors of your pudding mix to easily make a different flavor. You can make a sugar-free version by using a sugar-free pudding mix. You can stir in chocolate chips if you want more chocolate bang for your buck (and I DO!) Or you can stir in chopped pecans and miniature marshmallows for a rocky-road version. How about swirling a little chocolate sauce through? And with vanilla-flavored ice cream there’s my favorite option: Chop up that chocolate bunny you bought for 90% off after Easter & kept in the freezer for just such occasion. (you DO that, don’ t you??) Then stir it into the ice cream along with just a couple of drops of peppermint extract for delicious mint chocolate chip flavor. Ummmm… Yes please! 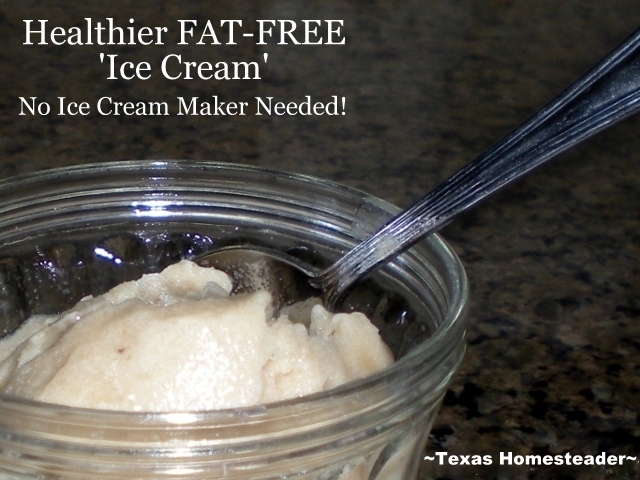 So there ya go, a homemade dessert that’s a healthier version of the commercial high-fat stuff. Hey, any time you can remove some of the guilt of eating ice cream on a hot summers’ day it’s a winner, yes? Now you hush up and eat your ice cream! In a blender, put ½ cup of cold fat-free milk, 1/2 teaspoon vanilla and 3 frozen bananas (chop them up prior to adding them). Blend until smooth. Add the pudding mix and blend again until no lumps remain. Pour into freezer-safe container and stir in additional flavor options such as chopped nuts or chocolate chips if desired. Freeze for several hours until firm. Enjoy! NOTE: I also make a delicious Mint Chocolate Chip version! Update: Here is one of our new faves! It’s made with bananas, chocolate pudding mix, 3 Tablespoons chopped white chocolate & about 2 Tablespoons chopped pecans, adding 1 Tablespoon each cold black coffee, vanilla, and Kahlua. Rich & DELICIOUS! This entry was posted in Blog Posts and tagged Cooking, Make-It-Yourself, Recipes, weather on June 28, 2013 by Texas Homesteader. Does the order affect the texture? Can I make ahead the vanilla pudding mix with the milk and freeze it in an ice cube tray then blend it with the vanilla extract and bananas? Am in the middle of making the ice cream using frozen bananas and pudding. Question: recipie calls for one box instant pudding mix– Is that the large size (2.1 oz) or the small box (1 oz) size???? Love banana based ‘ice creams’. Thanks for sharing with Simply Natural Saturdays. Never thought to add pudding. I typically will make strawberry ice cream, just frozen strawberries and greek yogurt. Yum. Thanks for sharing. to make chocolate ice cream, would I just change the vanilla pudding mix for chocolate pudding mix, or would I add cocoa powder to the vanilla pudding mix? this is something I am really looking forward to trying. Thank you so much. I’ve heard of making ice cream with bananas but I bet the pudding mix makes it way tastier. I love all your ideas for how to change up the flavor too. Thank you for sharing. Awesome! I use to do this in my vitamix, but forgot about it! Thanks for sharing! This looks so good…even though it is the middle of winter. I’m so glad you pinned it and your other recipes to the Future Expat Required Ingredient link party. This looks so yummy! I’m going to try it. Thanks for linking up with It’s a Mom’s Life. I hope you’ll join us next week too! I’m going to try this today. I may substitute almond milk. My coworker, who is doing WW with me, and I were talking about how much we miss [real] ice cream on our programs. We can have anything on WW, of course, but neither of us can be trusted with the real thing. I can eat it until it comes out my ears. This sounds really good. Yum! My husband made strawberry/mango ice cream in our Vitamix last week. Love it! Tastes like fruit and no tasty ingredients! I noticed that you used refreshing 2% Braums milk. I unfortunately don’t have that brand here in NC (although if I did it would be the ONLY brand of milk I would buy). Is the recipe as good with a skim milk or does it only reach the right texture and flavor with a 2% milk? P.s. I miss Braums. I sure will try this. Sounds refreshing.